1 Open the Excel file in which you want to create a new Microsoft Project file as an embedded object. 2 Select the location where you want the new Microsoft Project object to be embedded. 4 In the dialog box, click the Create New tab. 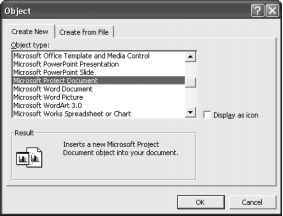 5 In the Object Type box, click Microsoft Project Document (see Figure 17-10). Figure 17-10. Use the Insert Object dialog box to create a Microsoft Project file as an embedded object. Part of a view of the new project file appears. If you selected the Display As Icon check box, the embedded project file appears as the Microsoft Project icon (by default) in the selected location. 8 Double-click the new project to add information to it on the spot.